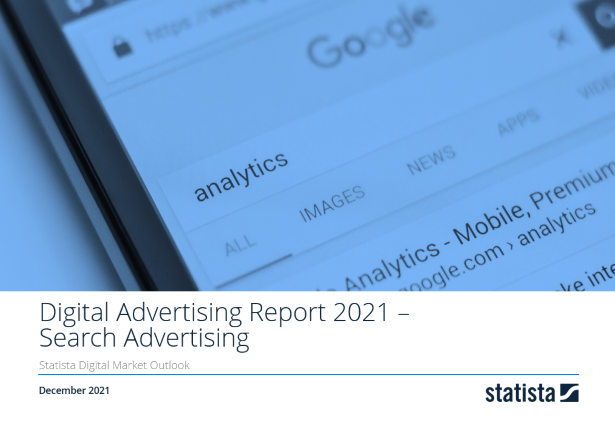 Revenue in the Search Advertising segment amounts to US$36,513m in 2019. Revenue is expected to show an annual growth rate (CAGR 2019-2023) of 2.3%, resulting in a market volume of US$39,935m by 2023. Search engine advertising (SEA) or Paid-for-search advertising describes advertisements that are displayed on search result pages above or next to organic search results. These advertisements are usually text-based, but can be displayed as images where applicable. Sponsored links and keyword advertising are part of search engine advertising which can be targeted on local or keyword-related factors. Google AdWords is the biggest provider of search advertising on the market. Not included are revenues generated through search engine optimization (SEO). Reading Support Ad spending in the Search Advertising segment amounts to US$36,513m in 2019. Reading Support The Search Advertising segment is expected to show a ad spending growth of 1.9% in 2020. Reading Support With a market volume of US$36,513m in 2019, most ad spending is generated in United States. Here you can find more studies and statistics about "Search Advertising".